The climb to the Lyskamm Occidentale takes place along the first stretch on the ascent route to Castore. 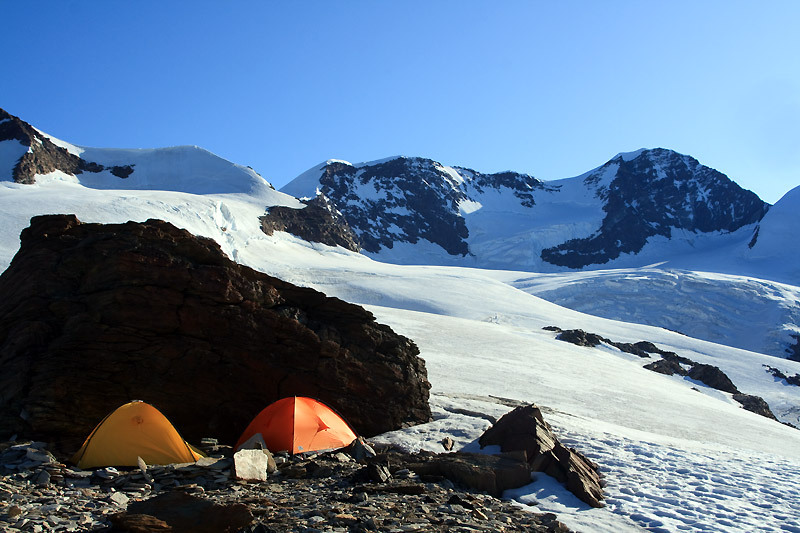 Depart from the Quintino Sella Refuge before dawn and follow a visible trail that leads to the glacier. The trail passes by the detour leading to the Naso del Lyskamm, in order to get close to Punta Perazzi. Continuing to the right leads to the southeast base of the Colle del Felik and follows some steep switchbacks, until it reaches the ridge. Next, the path keeps to the left of the slope that leads to Punta Felik, proceeds on to the plateau of Zwillingsgletscher, leaving behind the path to Castore, and approaches the ridge of the western slope of the Lyskamm Occidentale. Going up the west leads to some ups and downs, and the ridge becomes sharper and more exposed. It is a section that should not be underestimated, especially in the presence of strong winds or heavy snow. Next, the path climbs up a snowy slope with gradients up to 45°, where in the case of little snow, it is advisable to instead climb along the rock ridge to the right to avoid crossing the ice outcropping. The path leads directly to the last stretch, which joins the forepeak with the summit of the Lyskamm Occidentale. It is the final and easiest ridge, but should be followed with caution. The return path to the Quintino Sella Refuge follows the same path as the ascent, after admiring the fantastic view of peaks that stretch from the Valley of Gressoney to that of Ayas with views of Punta Dufour, the Nordend, the Zumstein, the Gnifetti, and Parrot’s peak.